fave with in-the-know business travelers, the Residence Inn by Marriott Boston Harbor on Tudor Wharf is crazy cheap, with breakfast included (make your own waffles!) and kitchens in the rooms so you can save even more. Right on Boston Harbor with the luxury vessels of the hoi-polloi at anchor in the (unaffiliated) marina just outside, the hotel is right on the Harborwalk pedestrian trail and just a short walk across the bridge to the North End, TD Garden, and the Faneuil Hall Marketplace area, and has the feel of a resort, with a pool and a pier from which a water taxi serves the airport, Long Wharf, and other harbor destinations. Leave your car at home; there’s a hefty charge to park. It costs $350,000 a year to dock a yacht valued at $55 million or over. 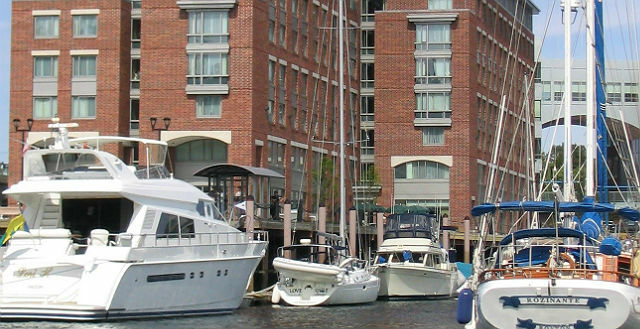 These lines serve the Residence Inn by Marriott Boston Harbor on Tudor Wharf. Click to find more secrets on your route.